I carry guilt around like a bonafide Catholic. Or at least that’s what my spiritual, not religious, mom has always told me. Guilt is as apparent on me as the sweat that drips from my brow when I know I’ve done wrong. My chest breaks out in hives when I nervously spin a ‘Pinocchio,’ my Dad’s euphemism for a big fat whopper of a lie. You can’t mistake when I’ve made a mistake. When I was a kid I would come home from school in a panic having been reprimanded by my teacher for talking during quiet time. Upon full and immediate confession, I would then send myself to my room for a well-deserved, self-imposed time out. To write another word without confessing the guilt that’s been plaguing me for the last couple of months would be to share with you a disingenuous blog post, one that would only make me feel more guilty. So here goes: many of you have asked why I haven’t been posting on Amy Burns the Recipe Book lately. “What’s the deal, you quit blogging?” I haven’t quit, I refuse. After all, I still haven’t gotten my call from Food Network or Bobby Flay. I can only attribute my hiatus to two rather mundane factors. First: I’ve been busy. With work. With travel. With home decoration. With figuring out my life. With friends. With family. With my boyfriend. With all of the stuff that keeps you busy. I blinked and the summer was gone. A couple of weeks ago I traveled to Puerto Rico to speak at a women’s, young worker, and human rights conference. I was dismayed to step out of the airport in Louisville and realize that the temperature had dropped 20 degrees and all of the trees had transformed into a crispy blanket of fall’s red, yellow, and orange. Speaking of Puerto Rico (not a bad place to work, by the way), I’ve been traveling a ton lately for work, mostly to much less exotic places. Late summer and fall is my busy season, and in the past three months I’ve crossed dozens of state lines and been on more planes than I prefer. Second: When I read a food blog I usually read the opening paragraph of the text above the pictures and recipe, and if it deals only with the details of the dish I usually pass right over the wordy body to the pretty photography and numbered instructions for cooking. I love a good story. When I read any kind of blog I want to know who you are, what you’re passionate about, and why it’s important that you share this piece of your life with an audience. Otherwise, it feels to me like reading the script of a cooking show, only without the excitement of the lights and camera. In short, I’ve been running around like a chicken with my head cut off and didn’t feel like I had the time to tell you all a good food story. I’m not sure if this confession constitutes a good food story, to be honest. But whenever I’m feeling stuck and not sure what to write next on this online food journal, my boyfriend David always says, “Just be honest.” I’m not any good at spitting anything other than the truth, believe me, I’ve tried. And so I thought I’d get back into the thick of blogging by issuing a heartfelt, albeit probably completely unnecessary confession and promising to try to do better in the future. My work tends to slow down right before Thanksgiving, and I’ve got a couple of foodie ideas I’m excited to share with you. So thank you for your patience and stay tuned. In an effort to win your forgiveness, I’m backatcha with one of my favorite, completely original recipes. Paleo friendly, David approved, and topped with bacon (f-u World Health Organization), these two-bite sliders are at once comforting and chicly gourmet. Preheat oven to 400 degrees. 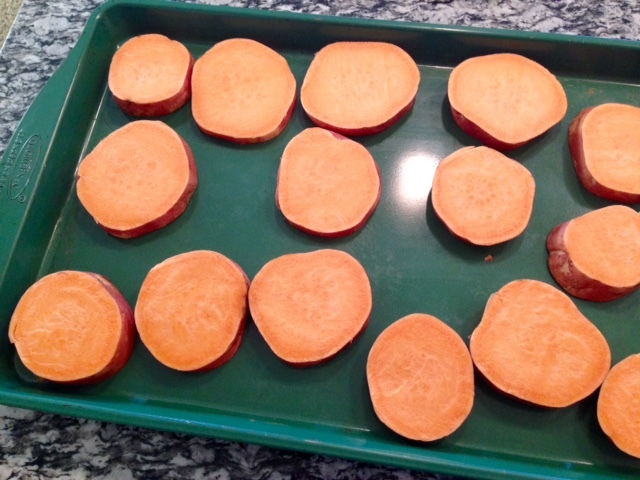 Place the sweet potato rounds on a non-stick cookie sheet. 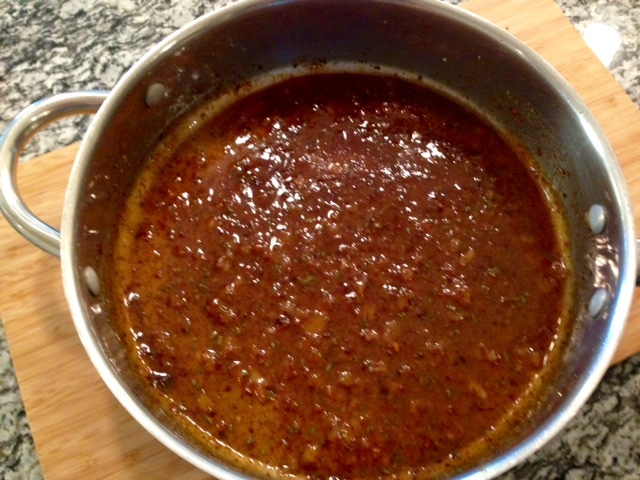 Drizzle with olive oil and sprinkle with the spices (salt, pepper, garlic, and onion). Bake for 20 minutes; remove from the oven, flip, and cook for another 15-20 minutes until the sweet potatoes are slightly brown and crispy. While the sweet potatoes are cooking, place the chicken on another cookie sheet, drizzle with olive oil, and season with salt and pepper. Bake for 10-15 minutes for chicken thighs, 15-20 for breasts. Remove from the oven and place in the fridge to cool. 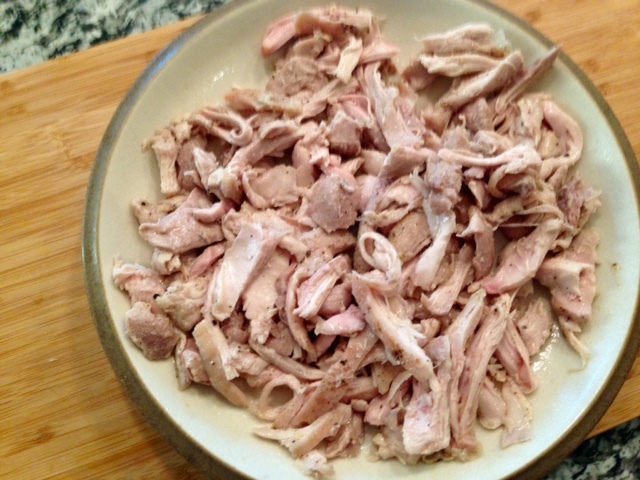 When the meat is cool enough to touch, remove it from the fridge and use your hands or two forks to pull the chicken apart into bite-sized pieces. 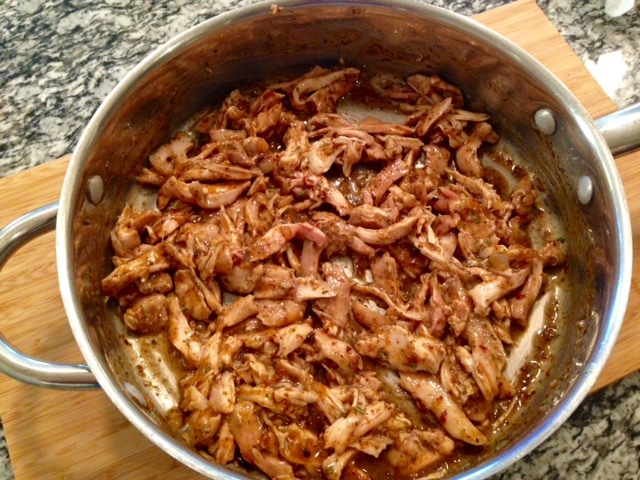 Start your sauce for the chicken in a large skillet. Cook the bacon on medium heat until extra crispy, about 12-15 minutes. Remove from the pan and let drain on paper towels. 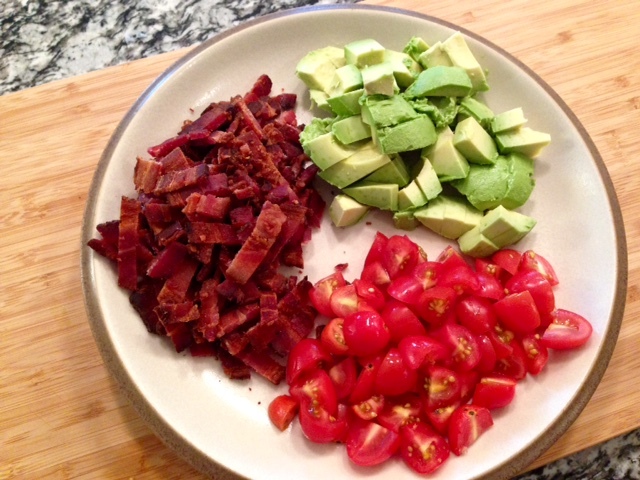 When cool, chop the bacon into small pieces and set aside. Pour off all but two tablespoons of bacon fat, leaving the remainder in the pan. Turn up the heat to medium and add the chopped onions. Be sure to scrape the bottom of the pan to loosen the crispy bacon bits. Saute until tender, about 5 minutes, and then add the garlic and stir until fragrant, about a minute more. Add the maple syrup, mustard, and fresh herbs and stir to combine. Throw in the pulled chicken and mix in the sauce until it’s thoroughly coated. 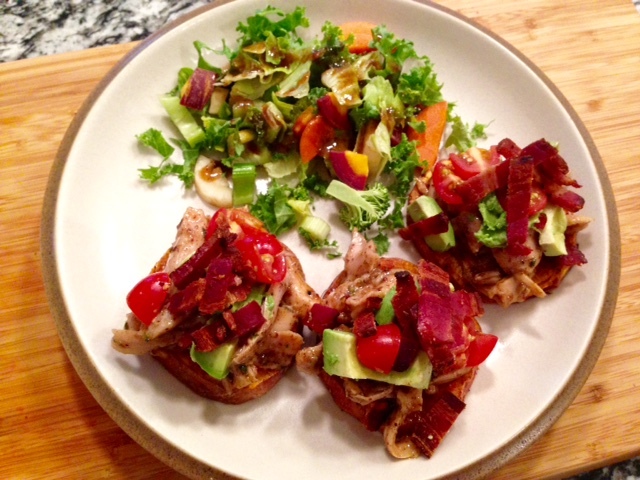 To assemble the sliders place the pulled chicken mixture on top of a sweet potato round and then sprinkle with the bacon, tomato, and avocado.